The Courtyard Area...There is a lawn & courtyard area outside the back doors of the barn for your use. This area is surrounded by sugar maples and white birch trees. Romantic white lights shine softly overhead while you and your guests relax outside and enjoy the evening while listening to the music drift softly from the barn. We have designed a unique bar area just inside the front barn doors for your caterer to use as well as a small outside bar area if you choose to have two bar locations! Our barn is disabled accessible (except loft area) and our restrooms were designed with that in mind. Having ground level entrances and near-by parking spots reserved we make it easy for all guests to come to your events. Our large dance floor has large sliding barn doors as the backdrop...By adding or draping or greenery packages you can customize the look of your dancing area. When your guests need a break from cutting it up on the dance floor they can stroll outside and find several quiet seating areas and a smoking area. We have plenty of space for your caterer to set up outside and close to the barn. 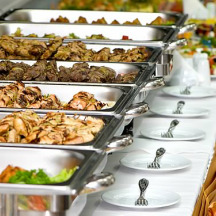 ​We have a large list of approved caterers for you to choose from. All the caterers on our list have previously served here and know exactly how it works making for a very smooth wedding day for you! Click Here to: Check Out Sand Creek Post & Beam...Our Barn is made here in the USA! !